After a long wait, yesterday came the evening of the Sanremo Festival where we could see the boys again. They sang three songs, NESSUN DORMA, CANZONE PER TE, and LA VITA E’ ADESSO. Beautiful in Armani, they immediately presented themselves with NESSUN DORMA. They had a very long applause from the audience and a standing ovation. The audience liked the show very much. Soon after they paid homage to Sergio Endrigo, composer of CANZONE PER TE. They performed it together with Baglioni and in the original version. Honestly I prefer when the guys sing it alone in their version. Baglioni asks Piero, Ignazio and Gianluca, what an effect it has been returning here since 2015. Ignazio replied that after three years, great emotion. We were born here in 2009 with TI LASCIO UNA CANZONE (was broadcast by Sanremo) as a trio. We won the Sanremo Festival in 2015 and meet again here after three years and be received with a great standing ovation is a great honor and pleasure. Baglioni continues by saying that yesterday there was a tribute to a great composer, Luis Bacalov and tonight we would like to make another tribute as is the custom in this Sanremo for a great singer-songwriter and performer who has been missing for thirteen years, Segio Endrigo. Sergio Endrigo won exactly 50 years ago in 1968 together with Roberto Carlos ……. what did you do 50 years ago in 1968? Piero answers that their grandparents went to work. Then they left the stage and we all thought that their performance was over. We were also disappointed with just two songs. After a long wait, towards the end of the show, they came back to sing LA VITA E ‘ADESSO, a beautiful song written by Baglioni. They sang, IL VOLO and BAGLIONI, and it was fantastic, engaging, loose, sung well and involved the audience who gave many applause and another standing ovation. After so much waiting, all over, beautiful memories remain and the certainty that the boys are always in good shape. Nothing has been said about their next projects. Congratulations guys, ahead of all. There were several Instagram messages and FaceBook posts from the guys about their upcoming appearance on the fourth episode of “Amici di Maria de Filippi,” which aired on Canale 5 in Italy, on Saturday, April 15, 2017. (Thank you to Lisa Joy for posting it very quickly for all to see!) This is another talent show in Italy. This time, the guys were singing “My Way” for two competing male dancers. 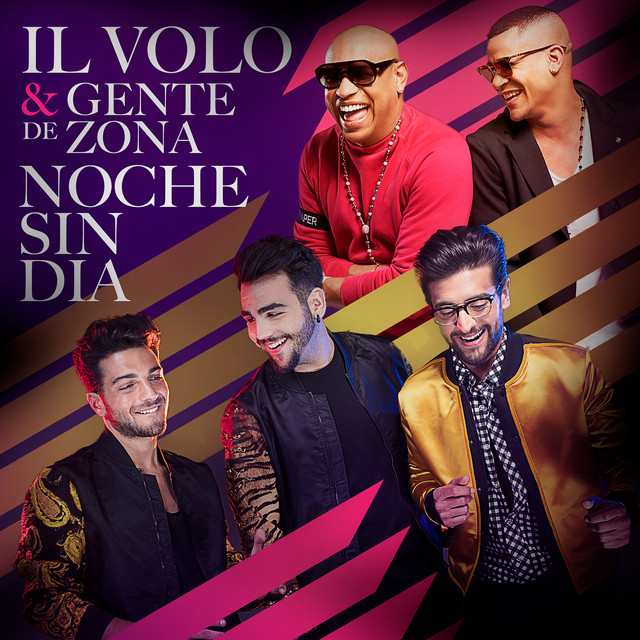 It was a trio this time for this song and I thought the addition of Ignazio was incredible. I loved the little jazzy softness he gave to the song and I always love when he goes for the high notes at the end. They looked and sounded beautiful as always. 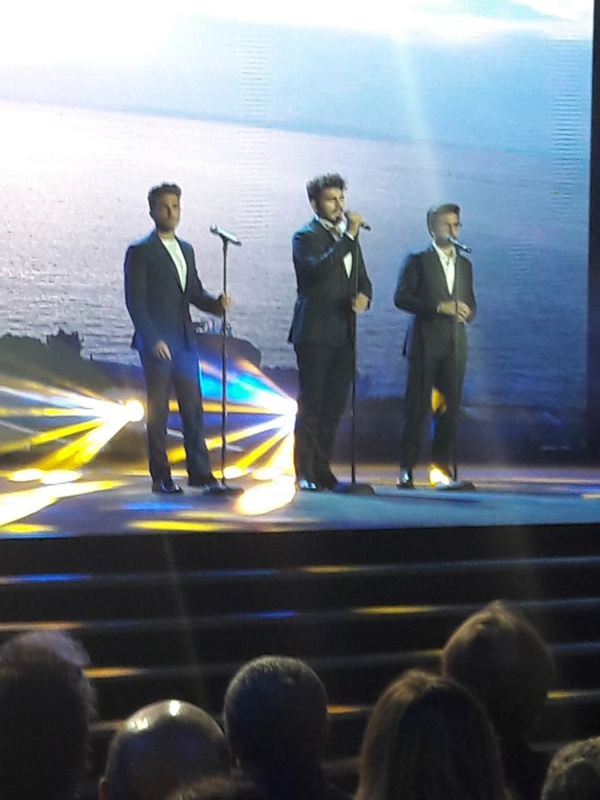 Thank you to Grazia Sabatini for some still shots from the program of Ignazio and Piero. A nice 4 picture arrangement of Piero! This has to be my favorite expression from Ignazio in this song! Although I did not see the same for Gianluca, I thought I’d add this one he sent us to wish us all a Buona Pasqua! I didn’t think anyone would mind…. 🙂 On his Instagram, he said Erny took the picture – good job Erny! Take care everyone and be patient! Their next concert is just a week or so away! Atlanta, April 3, 2017 – Our Last Notte Magica! It was a last-minute decision, but I decided I could not bear the thought of not seeing the guys one last time before they left the United States for who knows how long. Had heard various reports from they were taking a year off, to they were “evaluating options,” and most recently from Gianluca – “see you in a few months!” from his Instagram story! Well, I wasn’t taking any chances! Lorna and I saw them at the beginning of this tour in Florence and we saw them at the end of it in the US! I quickly analyzed their remaining concerts and figured out the best option and it ended up being the Atlanta show. We could still get meet/greet upgrades and there were still some decent seats left and the timing was good all-around for me taking a few more days off work and flight costs, etc. I called Lorna and asked if she wanted to go to Atlanta? She was all in! We quickly bought the tickets, bought the upgrades (ouch! ), then booked the flights and hotel. We stayed at the Artmore, practically right across the street from the Atlanta Symphony Orchestra where they were playing. We flew out Saturday evening and arrived about 8:30p to the hotel. There was a wedding going on in the courtyard, so we could not go out there. From what a few persons told us, it was the same place the guys stayed last year. Yeah, doubt we’d get that lucky again! The location was perfect and right across the street and down a bit from the train and transportation center – MARTA. Sunday, April 2, brought a beautiful, sunny, gorgeous day, with a high of 81. We had decided we wanted to go to the World of Coke, so we asked at the front desk how to get there. Oh, she said, just go across the street to the train station and you catch the train into town, etc. Was pretty cheap, just $2.50 one way. Wow, seemed like a grand idea to us. So, we headed out after breakfast and away we went, crossing the street. We went to the right and the only thing we saw was this driveway going up that said “buses only and that pedestrians will be arrested!” What? Uh oh, don’t want to take any chances there, so we went in the other direction. Must be the other way? Ok, we walked, and got almost to the corner and realized, this was too far, so turned around again. Saw this other driveway/street and decided that must be the way. So, we hiked up this hill, brought back some fond memories of being in Italy. We finally make it to the top and realized it was the arts center and that the symphony must be behind there. We went up some more steps (more shades of Italy!) and lo and behold, there it was! Ok, perfect. We can walk here – but wow, up that hill and if it’s raining? Well, we’ll decide on that later. Came back down and walked in a few more circles until we finally came to the place where we decided it must be the terminal area. It was pretty deserted, almost freaky. We found an elevator and took it down. We got out, and again, not a lot of people around. Of course, it was a Sunday. However, we did run into this nice worker who explained how things worked to these lost tourists from Dearborn! We ended up buying a 3-day pass and found out you could take this same train to the airport. What a deal! Uber cost us $45 from the airport – but we did get to ride in a Jaguar! We got off the train (lots of escalators!) made it to street level and were lost. Again, Google Maps to the rescue! We rounded a few corners and up and down some more hills. Who knew Atlanta was so hilly? We finally made it! The World of Coke was a lot of fun and I’d recommend it to anyone who visited the area. “Included” in your ticket was a free little 8.5 ounce bottle of Coke, Coke Zero, or Sprite, upon entry, while you waited for your tour and little info movie to start. We got through with that and the movie and you were on your own. We walked through this little exhibit on the history of how Coke got started, then made our way to get your picture taken with the polar bear. Then we went through the “secret vault” area. There was also this 4D movie with moving chairs, which was a little hard on your back. Saw the place where you got your pictures. They started at $30! No way! Kept on walking… then, the best place ever! The tasting room! They had these little kiosk like areas set up all over this huge room, with each continent/area of the world represented and each of the various “Coke” brand beverages there for you to try. It was pretty cool and you could taste all you wanted! After about 15 – 20 minutes, I’d had enough to drink! The last on the agenda there was the store. It was one of the most incredible souvenir stores I’d ever seen. It was huge and they had just about everything imaginable in there that you could think of that had to do with Coke. From mugs, glasses, and magnets, to phone cases, badge holders, lip smackers and even OPI nail polish, called Coke Red! And can’t forget all of the clothes and t-shirts. We got a little lost on the way back, but finally made it back to the train station and back to the hotel. We got back about 4p and were exhausted. I checked my phone and we had walked just over 6 miles. No wonder we were tired! We ordered in and also got a bottle of wine to take back to our room. Bummer the hotel had no type of real restaurant or room service. It was a gorgeous night and we took the last of our wine outside to enjoy the courtyard by the firepit. We knew storms were headed our way and I was keeping track of them. We woke to rain the next morning, but it was supposed to clear soon. We met briefly with Judy, Joanie, and the girls from Il Volo Miami, Gaby and Becky. We chatted a bit, anticipating the concert that night and relaying our stories from past concerts. Judy had gone to see them at Radio City. She did see them “almost” first and last in the US! Later, Nancy came to our room to get the extra ticket that Ticketmaster made me buy and after she had left, we went in search of another shuttle that was free to take us into town. That was a bit confusing. We asked at the desk if there was an easier way to get to the train station. We told the girl at the front desk we had walked around and up that big hill. She got a really good chuckle out of that one! She says no….. you go to your right and the entrance is right between those two benches… lol! So, we went her way and it was a whole lot easier. But just think of the workout our gluts got the day before! While on the bus, I got this instant message from Judy saying there was a tornado warning and they were moving to the ground floor and where was Nancy? I said, “I don’t know, we’re on a bus!” Sure enough, it had started raining again. I checked my phone and indeed there was a tornado warning for the next 15 minutes or so. Luckily, nothing materialized. The few persons that were on this bus got off and then it stopped. Lorna said, isn’t this where we started? Yes, it was? Well, lost tourists again – we went in a circle, but they never announced Peachtree Center or anything? Ok, we gave up and took the train again. After a few more little mishaps, we finally ended up at Lenox Station. Somehow, I had an easier time in Italy getting around than I did in Atlanta? Of course, when we finally got out, it was raining pretty good and we had neither a coat or an umbrella! We walked the short distance to the mall and I looked like an almost drowned rat. So much for my hair that night – would have to start all over. We proceeded to find Lorna a new outfit to wear and had an early dinner at The Cheesecake Factory. With all the walking we did, I still managed to gain 5 pounds somewhere! It couldn’t have possibly been the Nutella-topped, hazelnut chocolate crunch cheesecake I had for dessert, was it? It was so good. Not sure which was better, Gianluca singing, or the cheesecake. Ok, we all really know the answer, but that’s how good it was! We kept going south, when we wanted to go north, or was that just the opposite? Per my calculations, we ended up in our room about 30 minutes ahead of my schedule and had a full two hours to get ready for the concert. We were ready early, so decided to just start walking. We went the easy way around this time and it was a whole lot easier, although we still had to go up the stairs to get to the symphony hall. With the luck of Il Volo, the storms had passed and it had turned into a beautiful evening with even the sun peeking out. We got to the lobby area shortly before 6:30p. We looked in and there were quite a few people. This was a large building with 3 separate theatres. We walked in and Lorna noticed a large group of people in the corner. We walked over and it was the VIP table. A little different than the previous venues. We signed in and got our stuff. Shortly after, they opened the doors. There was a big sign that said no “flash” photography. Ok, we could turn the flashes off? We were good. Unfortunately, the ushers did not agree with our reasoning and were telling people they could not take pictures again. They were really watching, too. Several times we saw the meany ushers go up to people and tell them no pictures – me included! I did sneak a few here and there when they left their post. Luckily those in the middle, they could not get to, so they got to take pictures! Oh, the concert – lol! Like all of the others, it began with the orchestra and the guys came out to sing Nessun Dorma, etc. I had heard the ushers talking earlier and heard them say they had to end at 9:45p. Ok….after Granada, Piero began by saying it was their last concert and we all said “aw…..” and then he said they were glad to be going home tomorrow. Then Gianluca chastised Piero and said, “That’s not a nice way to start your last concert,” and of course we all laughed. They went on to sing, with several of the same little banter and jokes in between. They also took another 15 minute break. Orchestra again, and we were waiting for Grande Amore. Piero told a few little quips on how badly Americans pronounce Italian words. Like “macchiato” in Starbucks. He says, it’s not “macchiato” like the “ch” in macho, but like a “k” in Boschetto. Then Ignazio comments on how we say spaghetti – I guess we are lazy here and don’t pronounce each consonant separately, if there is a double. Then Piero says, “who is Alfredo?” I never realized, because I don’t like it, but apparently, they have never seen or heard of a person, as Chicken Alfredo in Italy. (however, I did look this up and it did start in Italy with a guy named Alfredo – he cooked this special dish for his pregnant wife). Since we had been to several concerts already and had reviewed several of them, we “thought” we knew what was going on. Still waiting for Grande Amore. They did their “fake” leaving and came back and sang O Sole Mio. Gianluca had also led the audience brilliantly a few times in clapping sequences during the Libiamo song. After they sang O Sole Mio, the crowd was on its feet. Lorna and I were tired, so we just sat there, knowing it really wasn’t over yet. However, the crowd did not stop. I finally got up and realized the guys were waving goodbye and people were handing them gifts, etc. Ok, that was a sure sign it was over! But where was Grande Amore, and the last Nessun Dorma? Yes, Atlanta, you were cheated out of 3 songs! Not only those two, but also Caruso. I looked at the time – it was 9:45p on the nose! Their voices were still superb and I swear I noticed a few little different nuances here and there. Again, it was all over way too soon, this time, for sure! We waited about the usual amount of time and then they led us down many flights of stairs. We wanted to go to the bathroom, but were afraid they would come get us and we wouldn’t know where to go. We were lucky and passed a bathroom on the way and asked if it was ok to use it. They said ok. Of course, everyone wanted to be last, so when we finally came down the stairs, you could see the icicle glares! We really didn’t do it on purpose, it just worked out that way. But, of course, everyone is so polite and said, “why no, after YOU, of course!” So, we weren’t really last, but that was ok, we were near the end, with maybe 20 people or so behind us. We never really counted. Ignazio was in rare form. They had their music playing in the background and he was singing his part every so often. Even Gian and Piero piped in once or twice I think. Although, after a little while, Igna told them to turn it off. Crazy me, I didn’t want Alessandra to feel left out, so I was up til 2:30am the night before we left, making both her and I, a scarf with the winged logo! I ended up doing a black scarf similar to Barbara’s with the gold, then crystal, and then black little “ends.” I think it came out nice. Leonora and Alessandra were sitting in chairs against the wall. It was a large room, but nothing fancy and they had tables set up to put your stuff on in the middle. There was also a piano in the corner. Ignazio was acting crazier than normal and dancing with a few of the ladies. There was one girl who had to be over 6 feet tall and very thin. No one could be taller than Igna, so he pulled over a chair and stood on it! People were saying he was not feeling well. If that was the case, he was putting on a pretty good show! When I got close enough, I approached Alessandra. I gave her the scarf and told her I had made one for her also because I did not want her to feel left out. I guess I spoke too quickly and she asked me to repeat it. I slowed down a bit and said I had made them for all of the mothers. Then, for me, the real surprise, I did mention Leonora, and then she said “the green one!” Wow, she does know some English! I said, “Si!” Alessandra said the “usual” “thank you so much!” and I got back in line. I don’t think she opened it. I also gave her a card, as I did for Leonora and Barbara. Hey, all their names end in an “a”?” Lol! It was my turn and I went up to each of them and gave them a hug, saying it was hugs from Detroit, then reached down to squeeze each of their hands, telling them we were really going to miss them for a while. I recall their hands being very soft and a little cold. I accidentally stepped on Piero’s foot – oops! I did the same with Igna (no, did not step on his foot) and also told him “remember it’s 3 parts flour and 1 part cocoa” and he laughed! I really have no clue if they really remember me or not. None of them said anything after I told them we were going to miss them. Did I remember to really look into their eyes? I’m sure I did, but I don’t remember. Oh well… I’ll just have to pretend I did when I look at their picture on my wallpaper at work! However, they remembered Lorna! She started to walk up there and Igna pointed to her and said, “I remember you!” She jokingly hid behind the backdrop for a second, then she said Gian told her she was a rock star! Ok, that did it, she was in heaven again and almost forgot to get her picture a 2nd time!! We were about to leave, when all of a sudden, we realized that Ignazio is singing and playing the piano! This one girl was having a long talk with Piero, so I guess he decided to kill some time! He performed Unchained Melody. It was so beautiful, his voice was loud and perfection! Their photographer got most of it, I think, so I hope it ends up on the Internet/Social Media somewhere! We were afraid they were going to make us leave, but they didn’t. What a special and as Nancy said, a “once in a lifetime” treat! That is for sure! There were still a lot of people in line, so I could not really see Alessandra during the song, which he of course, was singing for her. Afterward though, she seemed, not sure, almost a little annoyed. She crossed her legs and went back to her phone. They were waiting for him, so he had to go back to the m/g area and finish up. As we were leaving, I gave a little shout out, saying ciao and buonanotte. Barbara was standing there by the wall as we left and at least SHE remembered me! She saw me and said, “thank you again for the scarf!” I was so tickled right then! I told her I was so glad she liked it. Wonder if she’ll actually wear it? Then I told her we were going to miss them for the next few years. I also told her we’d love to see them back at PBS and that I would do everything I could to make sure they said Ignazio’s name correctly! She smiled and agreed! I told her for her to tell them…. Then we said goodbye. Lorna thought I had gotten lost, as she had gone ahead of me. So maybe I did not connect with the guys, but I did with Leonora and Barbara. I know there are many out there who talk to the mothers and Barbara and Alessandra, but I never did before, so it was pretty cool for me. With regret, our notte magica was coming to an end. We went out into the beautiful, magical night, under the stars, and walked to our hotel. As I think about this now, this is how we ended the first one! However, thankfully, there were no dive-bombing pigeons!